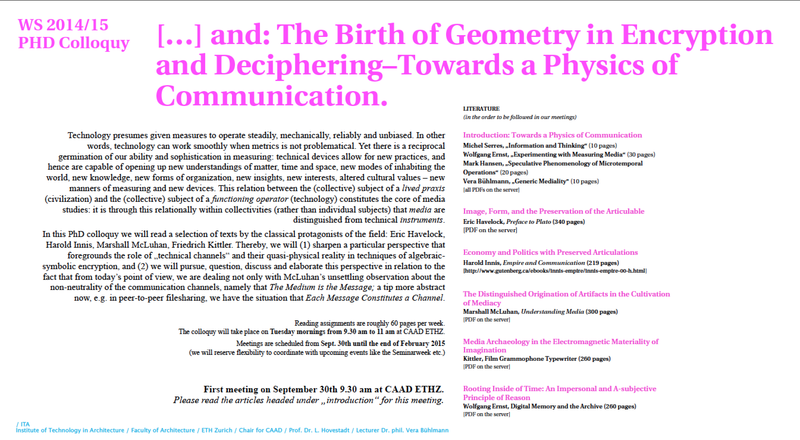 ….and: The Birth of Geometry in Encryption and Deciphering–Towards a Physics of Communication. Technology presumes given measures to operate steadily, mechanically, reliably and unbiased. In other words, technology can work smoothly when metrics is not problematical. Yet there is a reciprocal germination of our ability and sophistication in measuring: technical devices allow for new practices, and hence are capable of opening up new understandings of matter, time and space, new modes of inhabiting the world, new knowledge, new forms of organization, new insights, new interests, altered cultural values – new manners of measuring and new devices. 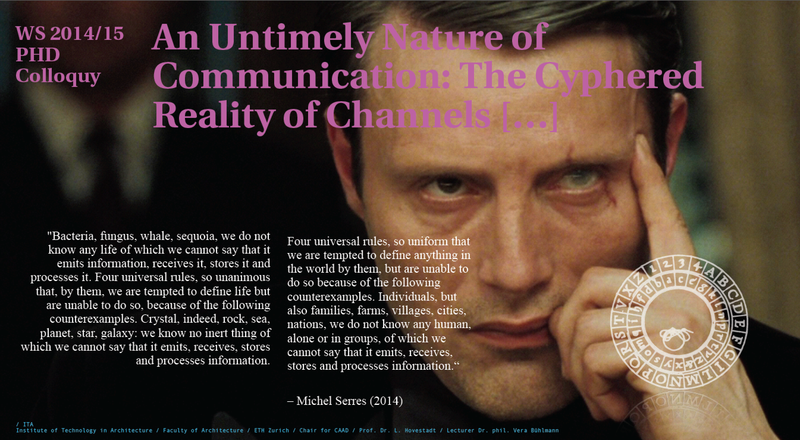 This relation between the (collective) subject of a lived praxis (civilization) and the (collective) subject of a functioning operator (technology) constitutes the core of media studies: it is through this relationally within collectivities (rather than individual subjects) that media are distinguished from technical instruments. In this PhD colloquy we will read a selection of texts by the classical protagonists of the field: Eric Havelock, Harold Innis, Marshall McLuhan, Friedrich Kittler. Thereby, we will (1) sharpen a particular perspective that foregrounds the role of „technical channels“ and their quasi-physical reality in techniques of algebraic symbolic encryption, and (2) we will pursue, question, discuss and elaborate this perspective in relation to the fact that from today’s point of view, we are dealing not only with McLuhan’s unsettling observation about the non-neutrality of the communication channels, namely that The Medium is the Message; a tip more abstract now, e.g. in peer-to-peer filesharing, we have the situation that Each Message Constitutes a Channel. Reading assignments are roughly 60 pages per week. The colloquy will take place on Tuesday mornings from 9.30 am to 11 am at CAAD ETHZ. First meeting on September 30th 9.30 am at CAAD ETHZ. Please read the articles headed under „introduction“ for this meeting. Tags: Algebra, cipher, communication, Ernst, Hansen, Havelock, information theory, Innis, Kittler, McLuhan, Measuring Media, media channels, neutrality, physics of communication, Serres, time baseness, time criticality. Bookmark the permalink.